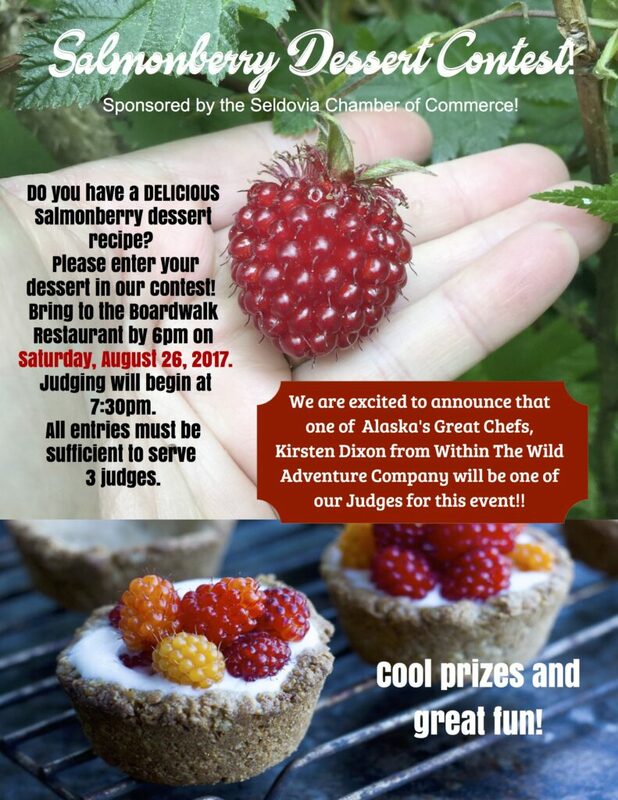 The Seldovia Chamber of Commerce is excited to announce the 1st Annual Salmonberry Dessert Contest! Salmonberries are often brand new to folks from outside our area. 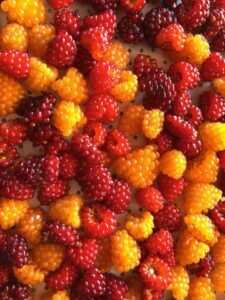 I know numerous people to come from the Homer side to pick our luscious salmon berries – as I guess there are very few locations to pick over there! We are the fortunate ones, salmonberries are ABUNDANT all around Seldovia! They look like a raspberry, but they are much bigger, and when ripe, they are very plump, juicy and don’t have the firmness of a raspberry at all! If you are picking and collecting in a deep bucket, they will be mush in the bottom – so pick carefully – you must treat them tenderly! The seeds are much bigger than raspberries and they flavor tends to be more tart. 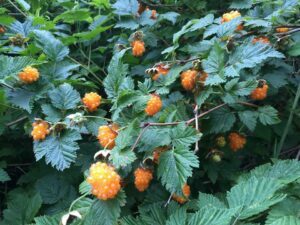 There are a variety of salmonberries from red, orange and yellow, and I can taste a difference, my favorite are the orange ones – when they are fully ripe! Mostly – I pick and eat, pick and eat! But, when I am collecting, I most often freeze and store them for shakes – or, because of the large seeds, jelly is the great option, and what you’ll find most folks seem to do! We are also very thrilled to announce that Kirsten Dixon will be joining us as a Celebrity Judge for the competition! Kirsten is a renowned chef in Alaska and owns Within The Wild Alaska Adventure Lodges including the Winterlake Lodge and Tutka Bay Lodge. Kirsten and her daughter Mandy are quite the team as in addition to the two lodges they are also managing La Belaine Cafe in Homer and the Cooking School at Tutka Bay! We are honored to have Kirsten join us for this special event! We will have two other local judges rounding out the judging panel for the contest! There will be prizes and awards - and so much fun! Start picking and practicing so that you will bring your “A Game” to the event! If you aren’t interested in submitting an entry – please come to dinner at the Boardwalk Hotel on Saturday night, enjoy a great meal, watch the contest/judging and hopefully have an opportunity to taste some of the entries! Dessert Potluck – Meet our New Principal!